Before we answer that, let us share some facts on the internet and mobile landscape in Malaysia. We are a proud nation of 120% mobile users with more than 17 million smart phone users. We are also blessed with healthy competition amongst telco giants such as Telekom Malaysia, Celcom, Maxis, Digi and many others; serving more than 29 million customers across the country. With the exponential growth of social media data and hosts of other mobile applications, internet users continue to demand more bandwidth, speed and consistent supply of internet connection in their homes. This forms the majority of the social media conversation. Customers have been found consistently throwing daily complaints, tantrums and rants on the internet speed coming through their respective home internet line and poor mobile coverage. There is a saying that silent majority needs to speak up. Unfortunately, the positive conversation on the topic centered around telco’s announcements on gifts and marketing promotions to entice more customers to subscribe to the range of products and services. There was minimal conversation on positive related conversations on either customer service or internet services. The conventional wisdom of “customer is always right” still applies until today. Every customer requires attention and some form of engagement. 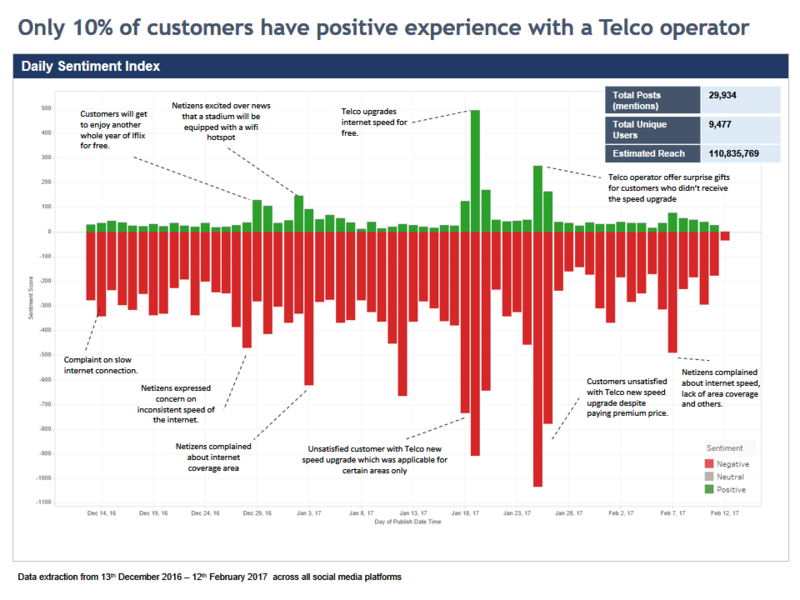 Our analysis revealed a significant number of complains that were not addressed by the telco operator. Another significant insight that we found that most people do not tag their telco operators officially to file their complaints. 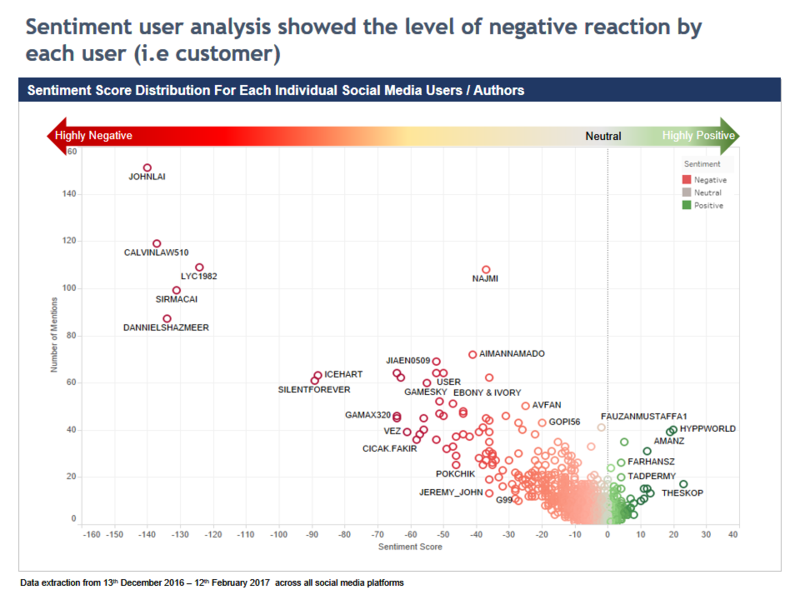 Our deep-dive sentiment analysis score for each individual user / netizen showed the echo effect of negative sentiment shared by other internet and mobile users. This effect is amplified significantly as more and more netizens are connected through a similar network of community. We detected a handful of highly negative users as shown in the chart below. Anomaly detection was also applied to remove the effect of spam bots and other Unusual Social Media Activities (USMA). A time to rethink the role of social analytics in organizations. Business leaders are constantly subjected to challenges such as growing or sustaining market share, customer retention, or understanding the effect of data-driven communication strategies to the bottom line. The relationship between user behaviour, purchasing intent, customer sentiment and the effect on future sales can be addressed using data analytics. The role of social analytics is viewed as one of many approaches that can complement the big data puzzle in order to obtain actionable insights. However, many are delusioned with the promises offered by off-the-shelf technology providers. In the world of social media monitoring, there are more than 250 social media monitoring tools in the market. At the same time, Gleanster research shows that more than 78% of organizations view sentiment as “important” or “very important”. However, businesses have to live with the existing industry gap between the world of text analytics and social media monitoring solution providers. In the case of sentiment analytics or even emotion analytics, businesses can hardly be expected to devote all their resources to perform such ambitious tasks. The outsourcing of data-analytics-as-a-service model is expected to deliver better output to organizations by aligning resources to perform value-added services such as improving customer service and other operational improvements.